The punk rock group the Killer Barbies battle Count Dracula. Dr. Seward appears, as does the Count’s caretaker, Irina von Karstein. 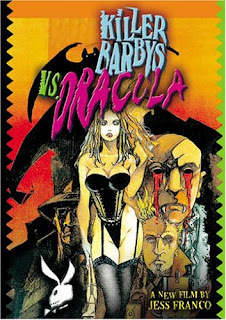 The Killer Barbies are a real punk group whose fictional counterparts previously appeared in director Jesús Franco’s film Killer Barbys (both films used a different spelling for the band’s name in the title, since Mattel would not let them use the name “Barbie.”) The Dracula seen in this film is likely a “soul-clone.” Dr. Seward is doubtless a relative of the doctor from Stoker’s Dracula. Irina von Karstein is played by Lina Romay, who played a vampire called Countess Irina Karlstein in Franco’s film Female Vampire. Either the two Irinas are the same person using different versions of her surname, or else the two are related. It is also possible that they are related to the similarly-named Karnstein family, whose members include another vampire, the title character of J. Sheridan Le Fanu’s “Carmilla.” It is worth noting that there is a blind metaphysician named Dr. Orloff in Female Vampire; this character is most likely a relative of the title character of Franco’s The Awful Dr. Orloff and its sequels. I've seen The Awful Dr. Orloff and Dr. Orloff's Monster. I was thinking the vampire from Nosferatu but that was OrloK.